By now you know that The Beauty of Life is a big fan of Lather (catch Jamie’s recent body wash post here). Each of their products is thoughtfully made with the highest quality plant or food based ingredients, and nearly all products are paraben and sulfate free. If you’re in the Los Angeles area, you must get yourself to their flagship retail store -- it’s what I like to call my happy place. Seriously, thinking about the store now actually makes me happy. The gorgeous space is bright, airy and very approachable. One of the many fun and creative things they do there is display a freshly cut apple: one side untouched, the other dabbed with Vitamin C Peptide Renewal. You can actually see the oxidation difference! They encourage you to try everything and there are two sinks just for that purpose. 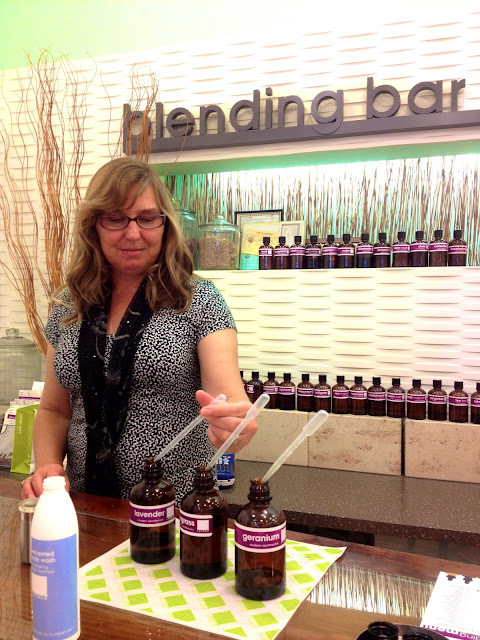 Something exclusive to Lather stores is the Blending Bar. Here, you can customize your very own essential oil blend into a body lotion, shower gel, jojoba body oil or roll-on. I see this as being the perfect gift. Who doesn’t like something made and named just for them? During my visit, Tracy, Lather’s resident aromatherapy expert, helped me create an exclusive The Beauty of Life bath gel. After a series of questions (I wanted something floral yet earthy) and lots of smell tests (interjected with whiffs of coffee beans to clear my nose), we began combining different ratios to create a beautifully soothing blend. The process was more than just fun -- it was art and it was enlightening. The pure oils are all different colors with different potencies, and they are extremely precious. Did you know it takes up to 10 thousand pounds of rose petals to create one measly pound of oil? That means the oil is truly the essence of its original form, and because of that, it has wonderful healing powers. I literally felt my entire body relax with The Beauty of Life blend and Tracy told me why: lemongrass soothes sore muscles, lavender calms the mind and geranium balances hormones. And there’s more exciting news! Lather is coming out with 3 limited-edition summer blend body oils, which will be available both online and in stores after Memorial Day. Let me tell you, I cannot wait to get my hands on them! 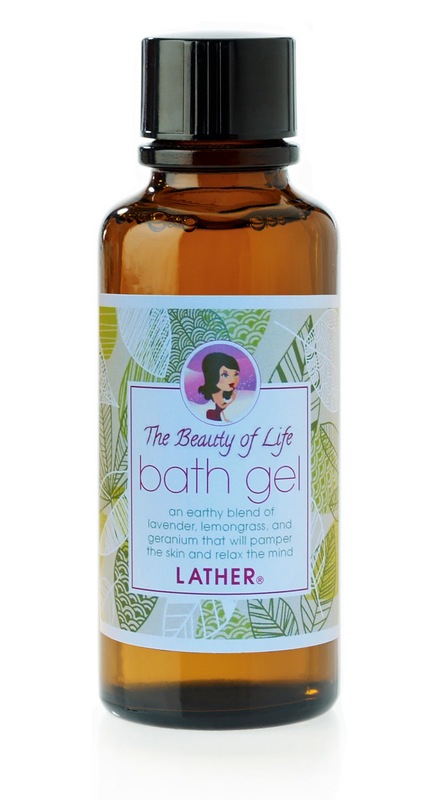 The Beauty of Life bath gel comes in a beautiful 4oz amber bottle with a specially designed Lather + The Beauty of Life label. Isn't it adorable? And here's the best part. We’re super excited to have the opportunity to host a special giveaway of this bath gel! FIVE WINNERS will have the chance to receive this exclusive bath gel. Here's how to enter. This giveaway ends on Thursday, May 30 at midnight. FIVE WINNERS will be chosen AT RANDOM on Friday, May 31. Maximum of SIX ENTRIES (one for each way listed above). Multiple entries will be disqualified. Giveaway is open to US residents only. This sounds wonderful, I'd love to try it! Any excuse to relax! And having a new bath gel is just that! I love anything with lavendar and after working 2 jobs 6 days a week, I could use the relaxation! I could use this bath gel because I really need a little TLC. Things have been so crazy lately. Because I only ever take baths (very rarely showers) and I loveee the scents of Lavender & geranium. I love lemongrass! I'm so excited to try this! I could use it to treat my skin! It would be my excuse to relax if I won this! I could use this because it would be soothing and relaxing. My skin would appreciate it. This would be perfect when I am sick with a cold. Mama needs a a relaxing new bath gel. This scent combo sounds divine! The lavender would be perfect for soothing the skin after a long hot day of working in the yard! Would love to pamper my skin with this bath gel. I'm always looking for a good bath gel. I could use this because I am always running out. Also, it looks so relaxing! I don't have a bath gel with all of these quality ingredients. I could use this bath gel because I love experimenting with new fragrances and a product that really lathers is icing on the cake! I could use this bath gel because I have very bad arthritis and I think anything that can soothe my muscles is worth a try. Besides, I love lavender scents as well. :) Thanks for the giveaway! I love that it has lemongrass as one of the scents. I have very sensitive skin and this sounds divine. I would love to find new bath products that I love. The bath gel is paraben and sulfate free-no harsh chemicals to irritate my skin!